Are you having trouble deciding between Invisalign vs. Smile Direct Club in NYC? Interested in learning more about which treatment is best for you? Invisalign teeth straightening has become a popular treatment for patients in NYC. Gone are the days of metal braces, brackets and wires thanks to the innovative teeth straightening system that involves removable invisible aligners. Chances are you have already seen hundreds of commercials regarding Invisalign and Smile Direct Club and wonder if it’s an option you can consider. The dental industry is noticing a variety of alternative at-home teeth straightening treatments that rival Invisalign. As a consumer interested in straightening your teeth you most likely are interested in the difference between at-home teeth straightening companies like Smile Direct Club and Invisalign that is overseen by a licensed orthodontist. The information below will help you decide which option is best for you. Can’t decide between Invisalign vs. Smile Direct Club? Interested in learning more about which treatment is best for you? Please contact Dr. Jacquie Smiles for more information on teeth straightening treatments with clear braces by calling 212-972-3522. Our office is conveniently located near 30 East 40th Street, New York, NY 10016. Save up to 35% on Orthodontics Treatments. Schedule your appointment today. Insurance accepted. Invisalign treatment involves a visit to your orthodontist’s office in NYC. During your appointment orthodontist observes any issues that can be solved with the use of Invisalign teeth straightening treatment. An important factor about receiving Invisalign treatment from an orthodontist is the in-person benefits. Surprisingly, many patients are unaware of serious issues hiding in their mouth. An orthodontist will be able to point these issues out, correct them and prepare you for Invisalign treatment. Once you are prepared to receive your Invisalign treatment, the orthodontist takes a 3D impression of your teeth with iTero Element scanner and creates a mold that is later used to create your custom made Invisalign aligners. These clear and durable aligners are used to shift and move your teeth into perfect alignment gradually. Monitored by an orthodontist – Your progress is supervised by a licensed orthodontist who will guide you and provide recommendations throughout your treatment. Minimal maintenance – Invisalign aligners are durable and easy to use. Generally, patients are advised to use one set of Invisalign aligners for two weeks at a time. During the two weeks, there is minimal maintenance required to care for the aligners. Cleaning them with water on a daily basis is recommended. Self-confidence – One of the most common complaints about standard metal braces is the lack of self-confidence during treatment. Invisalign aligners are clear which means onlookers won’t notice you are straightening your teeth. Comfort – As mentioned previously, standard metal braces, brackets and wires are uncomfortable for almost all patients receiving treatment. However, Invisalign teeth straightening treatment is smooth comfortable and almost forgettable during use. Removable – Orthodontists recommend removing Invisalign aligners before eating or consuming food and drinks. The easy to remove aligners can be placed in their case discreetly while the user enjoys a meal. Twenty-two-hour use per day – Orthodontists recommend Invisalign clear aligners are worn for at least twenty two hours per day. The only time patients should remove their aligners is to eat or drink. More expensive than standard metal braces – Invisalign aligners are highly affordable for almost all budgets, but the cost for treatment is slightly higher than conventional metal braces. Tooth discomfort – Invisalign aligners are responsible for gradually moving and turning misaligned teeth into place. This gradual process can cause discomfort and pain at times. Inconvenience in public – Patients that go to restaurants often feel embarrassed to remove their Invisalign aligners in public. However, most patients excuse themselves and go to the restroom to remove their aligners and place them in their designated safety case. Schedule your no-obligation Invisalign appointment in NYC with Dr. Jacquie Smiles. Please call 212-972-3522 or use our contact form to receive additional information. Treatment in NYC from the Smile Direct Club involves receiving clear aligner teeth straightening at home. These teeth straightening services are generally done through the mail by the use of at-home kits and aligners. 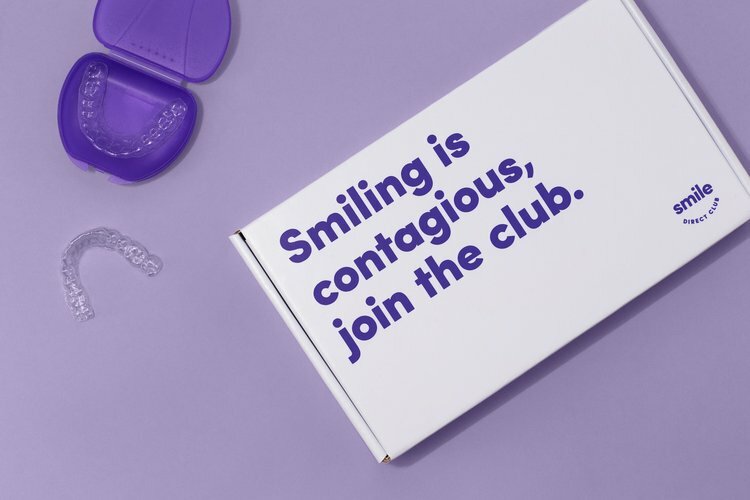 Patients receive a boxed kit delivered to their front door that includes the necessary tools needed to conduct an at-home mold of teeth. Once the mold taking process is complete, the patient sends the package back to Smile Direct Club. You may also visit their SmileShop locations throughout the NYC area near Financial District, Flatiron, Harlem, Upper East Side, West Village & Staten Island. Once the Smile Direct Club processing center receives the box, the clear aligners are custom made to suit the treatment of the individual NYC patient. Next, the aligners are mailed to the patient for immediate use. Using remote teledentistry, you will be assigned a duly licensed dentist or orthodontist. He or she will check in with you every 90 days through your customer account, and monitor your progress remotely. Offers flexible pricing options. Removable aligners – The clear aligners are comfortable to remove on a daily basis when consuming food and drinks. The average treatment plan is only six months – The time frame for the treatment process is based on the needs of the individual patient. However, most patients only require a six months plan. No attachments necessary – Standard braces often come with uncomfortable brackets, rubber bands, and metal wires. Clear aligners do not need any attachments that cause discomfort. Wearable while playing sports – Teen and adult patients will be happy to learn that clear aligner can be easily worn while being active and playing your favorite sports. Longer shipment process – Patience wait at least four to five weeks for their aligners to be shipped and received at their front door. Some pain and discomfort – Since the original molds are taken at home by the patient, an orthodontist is not able to pinpoint any severe issues before treatment begins. The oversight of serious problems not detected during the molding process can cause pain and discomfort during treatment. Removal before eating – The easy removal of clear aligners is often a benefit, but some patients have found it quite embarrassing when removing aligners in public. Difficulty speaking – The clear aligners are precisely molded to cover your teeth correctly. However, during the beginning of treatment, some NYC patients have found it difficult to speak correctly with the added layer of the clear aligner covering their teeth. Overall both Invisalign and Smile Direct Club provide patients with the opportunity to straighten their teeth with clear aligners. The main difference between both options is being under the supervision of an orthodontist. Patients that receive Invisalign treatment under the direct supervision and guidance of a licensed NYC orthodontist often avoid unforeseen discomfort, pain, and other issues while patients of Smile Direct Club often become anxious due to the lack of direct contact of an orthodontist. Are you ready to make your choice? Contact Dr. Jacquie Smiles today to find out if you are an ideal candidate for teeth straightening treatment with clear aligner braces. To schedule your appointment for orthodontic treatment in NYC with our orthodontist specialists, please call 212-972-3522 or fill out our convenient contact form to receive more information. Our office is conveniently located near 30 East 40th Street, New York, NY 10016.